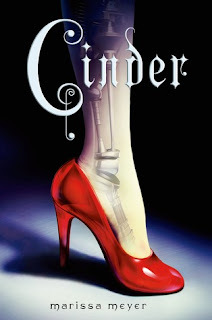 Cinder is one of those books that everyone really loved and raved about, so I knew I had to get my hands on a copy. Welp, I finally (I know!) read it and I have to say, I'm thoroughly glad I did. Not many books live up to the hype but this is certainly one of them. Cinderella wasn't exactly my favourite fairy tale but when you put a futuristic spin on it, suddenly, it becomes totally awesome! This book brings a fresh, new twist to fairy tale retellings with its heavy science fiction influence and incredible future-filled world building. You can definitely see the parallels between it and the original source material but the connections aren't so blatant that you're able to predict exactly where the story is going to end. That being said, there were a few big revelations regarding Cinder's true identity that I was able to pinpoint pretty early in, but overall, they didn't detract from my enjoyment of the book. There's a lot going on in Cinder --- androids, lunars, cyborgs, classism, intergalactic war --- but it's all woven together in a way that makes sense. And futhermore, there's the romance, familial relationships and friendships that bind it all together. Admittedly, I was more entranced by the Meyer's storytelling and compelling plot than I was by the actual characters which isn't to say they were bad, because they weren't. While I liked Cinder and Kai, they didn't captivate me in the way they seemed to do with everyone else. Instead, I was more interested in the book's secondary characters: Iko, Dr. Erland, Pearl, even Queen Levana. I guess I just didn't connect with the MC's as much as the others, though I did feel for their situations (equality struggles, political problems, etc.). Overall, I'd say Cinder was a fast-paced, fun read with a unique premise and culturally distinct setting which meshed so well with the book's futuristic vibe. What really intrigued me was Meyer's ability to add so much dimension to such a familiar tale by infusing so many diverse ideas into it. While I expected to engage a bit more with the MC's and though some of the surprises were anticipated, I wasn't at all disappointed. The book definitely lives up to the hype! I'm really excited to see how Meyer will weave this story into her next set of fairytales and am wondering exactly how they'll all manage to find their happily ever after. Cinder is one of the few stories that actually lives up to all the hype. A little bit classic and a lot sci-fi, it puts a fresh spin on fairy tale retellings. Though I wasn't as taken with our MC as much as some of the others, this book is a fun, quick read that will entrance a whole new generation of fairy tale lovers with its incredible uniqueness and wonderful world building. I'm really excited to see what other adventures we can get into in the sequel. You should, it's really well done!